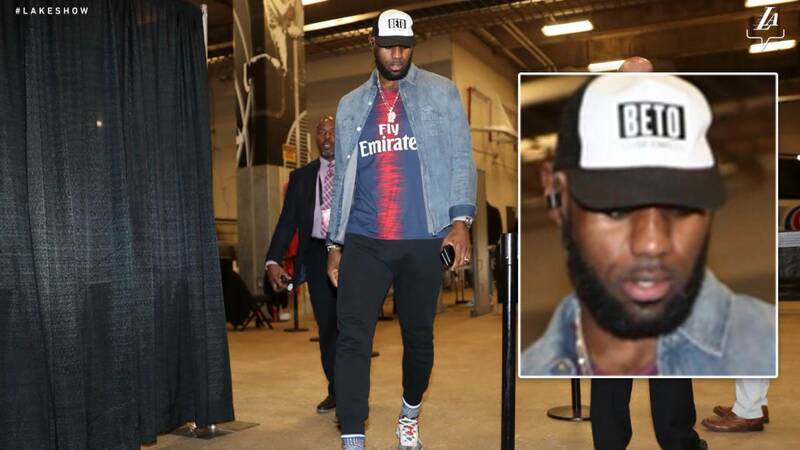 SAN ANTONIO - Los Angeles Lakers star LeBron James made a political statement Saturday night when he arrived at the AT&T Center in a "BETO FOR SENATE" hat. James, known to be outspoken on political and social issues, was photographed wearing the hat as he entered the AT&T Center before the Spurs-Lakers game. The Lakers included the photo of James in a Twitter post, and many were quick to point out the hat, which bears the logo of U.S. Senate candidate Beto O'Rourke. "Only @KingJames wearing a @BetoORourke hat could get me to like this," one person wrote. Another Twitter user pondered whether O'Rourke would enlist the help of James in his effort to oust Republican incumbent Sen. Ted Cruz. "Is Beto bringing out Lebron at his next event or what’s going on here," the Twitter user wrote. Both were in San Antonio last week speaking with constituents. President Donald Trump recently held a rally in Cruz's home city of Houston, boosting Cruz during early voting. Saturday's political statement isn't James' first recognition of the Senate candidate from El Paso. Earlier this year, James shared a video of O'Rourke sharing his views on kneeling during the national anthem. The video went viral and caught the attention of celebrities including Ellen DeGeneres. James shared the video, calling it a "must watch," saying O'Rourke, currently a member of the House of Representatives, had "candid, thoughtful words." A recent poll from the University of Texas/Texas Tribune shows Cruz leading O’Rourke 51 percent to 45 percent. The Spurs take on the Lakers at 7:30 p.m.